Chip Kidd, a man who has devoted 20 years of his life designing book jackets, offers a peek into the deep thought & art behind some of his most celebrated covers. A graphic designer for NY publishing house Alfred A. Knopf since 1986, Kidd has designed shelves full of books, including classics Jurassic Park, Naked by David Sedaris, No Country for Old Men, Conversations with Woody Allen, and many more. Note: Be sure to head to our website to view past Zaman projects on book & corporate literature design we’ve undertaken for some of our clients. Infographics, at their most basic, are visual presentations of data or information. Commonly used to present or explain complex data in simple, clear and direct ways. The popularity across various subject matters have increased as organizations & individuals find them useful for explaining statistics or facts in a way that captivates intended audiences while retaining relevance. This in turn influences the likelihood of audiences to then share this on within their respective networks. I think that what makes infographics particularly popular is their use of simple and reductive graphics to communicate ideas. Infographics have evolved from static 2-D graphics into animated graphics using both 2-D and 3-D visuals. As animation and related software continue to improve, infographics have become more dynamic and visual, thus making the information more interesting and comprehensible. Also, the fact that infographics are presented with sound effects and sometimes a narrator makes information even easier to grasp. 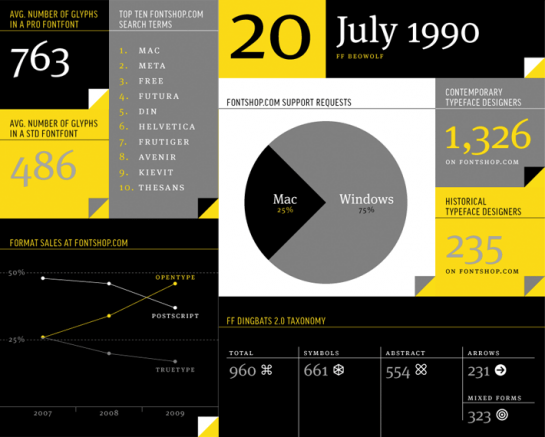 Infographics started as charts, diagrams, tables, graphs, flowcharts and maps. They then developed as technology advanced and started being more interactive and enhancing the visual quality of infographics. Software’s such as Adobe Flash, Adobe After Effects, Motion and Final Cut Pro are developing in terms of animatic production, and they are definitely the top programs to be used for the production of infographics, which is very much related to animation. The software’s have developed a flexible use of cameras making it possible to maintain cinematic effects. Below is an interesting video that I came across which conveys messages of a serious subject matter using very interesting visuals and a dynamic use of cameras. This infographic video is one of the best I have come across in terms of production, narration and graphics. What I like the most is the use of the limited color palette in the video, where the colors work in favor of the video rather against it. In terms of graphics and illustrations; they appear to be very well done. The level of the graphic’s simplicity works well with the text and the overall theme, especially given that the background is a ‘wall’, the graphics appear to have graffiti like effect, which I quite like. Also, the dynamic camera movement and the type layout keep the audience interested in following the information presented. Most interesting is the conclusion of the video where all the information forms a whole image that communicates and concludes the message of the whole video. I think this is quite impactful. Another ‘not so usual’ example of infographics that I found interesting is this tattooed infographics about tattoos. Every summer Zaman runs an internship program where design and communications students from the colleges across the UAE have the opportunity to spend a couple of weeks working alongside our creative team to get a feel for the agency life. I’d like to extend a warm welcome to our current intern Maryam, who’ll be working with us for a couple of weeks. To get to know Maryam a bit better, I asked her to answer a short Q&A and share an image that best represents her interests. Name of current college/university and your chosen course of study: I’m studying at the American University of Sharjah’s College of Art, Architecture and Design. My chosen major is Visual Communication, which I find quite interesting. Could you share 3 of your favourite blogs/websites? 1. I quite like Tumblr, which is a popular blogging platform for the creative and design fraternity. “If you have been sent here, then I need your help” – This was the message seen at the bottom of the screen by our colleague Nenita as she was navigating her way around a website discovered from a forwarded link she’d received. Intrigued, naturally, she read on. It seems there’s a revolution happening right under our creative noses and we were none the wiser. The concept behind website AntiSpec.com is so simple and so apt that it leaves us wondering “why hasn’t anyone thought of this before?” They already have. See NoSpec.com. “AntiSpec”, a short form for Anti-Speculative, is a campaign or rather movement of communication designers across the world; freelancers, consultants, agencies that are fed up of pouring resources, time and effort to compete against invisible competitors for speculative work. Speculative work, which is basically any job for which the client expects to see examples or a finished product before agreeing to pay a fee, has long been a practice of the creative communications space. Making this one of the few industries were clients get to ‘try before buying’ at a cost that is only credited to the individuals trying their hardest to win the client contract. Many professionals see the spec-work process as a threat to the design industry itself with many predicting the inevitable ‘commoditization’ of design brought on by globalization, more ‘cost effective’ design software and a bevy of designers, and would-be designers willing to work for free. The AntiSpec community calls out corporate clients that use sites such as 99designs, Crowdspring and Mycroburst to crowdsource logo design work usually from a database of hundreds, if not thousands, of designers across the globe, offering zero compensation if you don’t bag the job. At the time of writing this post Forbes.com has just posted an article calling out Huffington Post which launched a crowdsourcing logo design contest for its ‘Political Coverage’ column a few months ago. If the opening paragraph of the Forbes article is anything to go by (see below) then it’s safe to say that Huffington Post has just riled up the creatives fraternity. You can read the full article here. If you’ve flown Qatar Airways recently and flipped through their in-flight magazine ‘Oryx’ you might have noticed that they’ve been running an interesting print ad campaign, the central theme being things you’d do if you had 24hrs in a city like Barcelona or say Paris. Suggestions on things to do at a destination by companies in the travel and tourism sector is not really anything new but what we particularly like about this ad campaign is that instead of just listing down the activities or sights (albeit with creatively written descriptions) Qatar Airways has commissioned some interesting illustrations full of colour and shapes that to show what one can do within 24hrs in that particular city. Apart from being great keeper’s item (great idea for framing as a poster, maybe), for the more seasoned visitor to the destination we’d like to think that it also creates a bit of fun as you try to name all the images you recognize in each illustration. Below are samples of the ads. Have you come across these ads? What do you think – hit or miss?